← Giving peace a voice. The popular French writer and teacher Daniel Pennac, author of Chagrin d’école (translated as School Blues) and Les droits du lecteur (The Rights of the Reader) amongst others, has written a powerful essay on the refugee crisis for a book aimed at young people, with all the proceeds going to La Cimade, an organisation working with migrants, refugees and asylum seekers in France. 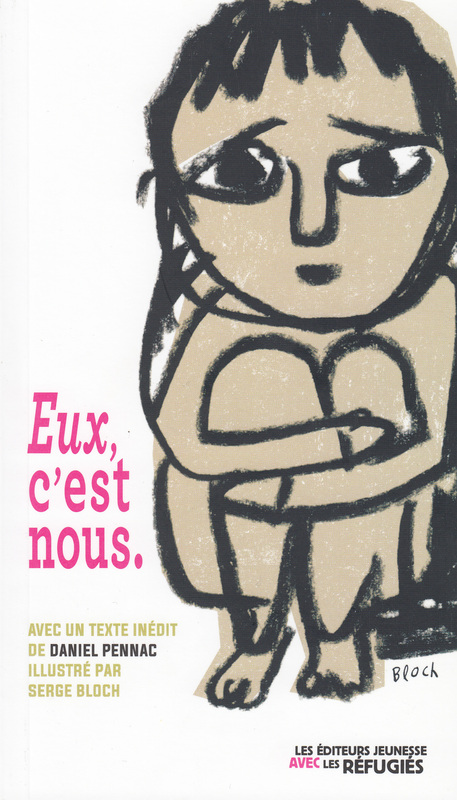 Pennac’s essay, entitled L’Instinct, le Coeur et la Raison (Instinct, Heart and Reason) was published in 2015 as part of Eux, c’est nous which translates as They are us. In it he outlines the basic humanitarian case for welcoming refugees and not labelling or stigmatising them. As far as I know, the essay is not yet available in English so I have taken the liberty of translating a few passages here for English readers with my apologies for any resulting infelicities. If you want to support the work of La Cimade, please donate here. “[We have to speak] of men, women, children who have been bombed, shot at, tortured, terrorised, starved, whose towns have been destroyed, whose houses have been burned, who have already lost a father, a brother, relatives, friends. [We] have to speak of refugees fleeing on roads that are hardly roads any more to save their lives that are hardly lives any more. These are the people we need to speak of aren’t they? These people who we could be among, who could be me or you. Or us. But who are them. “Let’s just disconnect. Concentrate. Listen to another silence; that needed to think things through a bit. How many of them are there really? The men, women and children fleeing these wars and knocking at our door? 500,000, one million, two million? How many are we in France? 66 million. 66 times more. Are 66 French people unable to welcome one of these people who are suffering? Well, perhaps. How many are we in Europe? 508 million. Are 508 Europeans unable to welcome one or two people who are suffering? Well. Perhaps. Let’s add 318 million Americans, 36 million Canadians…. “And we welcomed all these people. Making the case, despite an instinct of preservation, that the other can in their turn be of assistance, can in their turn be of support, can in their turn become French. And it is all those twentieth century refugees, judged too numerous on each occasion, who, with us, make up the France of today. This entry was posted in Culture, Politics, Reviews and tagged asylum seeker, Daniel Pennac, France, Instinct Heart and Reason, La Cimade, migration, refugee, xenophobia. Bookmark the permalink.